Classy cream bulletins allow you to print elegant wedding programs. Express your own wedding style through printing your own programs. These forms allow you to save money by eliminating the costs associated with outsourced print jobs. 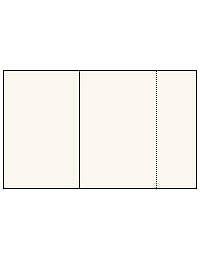 The bulletin forms measure 8-1/2” x 14”, with the tear-away card. These forms can be used in laser and inkjet printers.